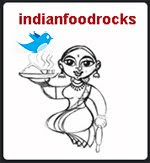 DO have a look at my food blog.. we are a small circle of desi cooks. I hope to link up ur blog..
And I don't think the comment spammers are spamming to boost their pageranks. As spammers they should know at least that comment won't boost ranks. rather they are doing for exactly what they are meant to do.. Spamming. SOme people do click... and I have even sen people who says thanks fpr visiting to a spam..
Hi Anthony, welcome to IFR! I don't mind genuine link drops to worthwhile sites like your blog. And Mumbai foodie blogs are always welcome!! But when an exclamation point or a period is hyperlnked to a web design shop or a site providing search engine optimization site, esp one that has no clue about SEO, really irks me. As soon as I set up the extra step of word verification on comments, the comment spam went away. I hadn't noticed that blogger had made that available. We'll see how this works or else I'll just have to switch to another CMS.